George Dower has inherited a business from his late father, a watchmaker whose skills extended beyond the manufacture of timepieces. 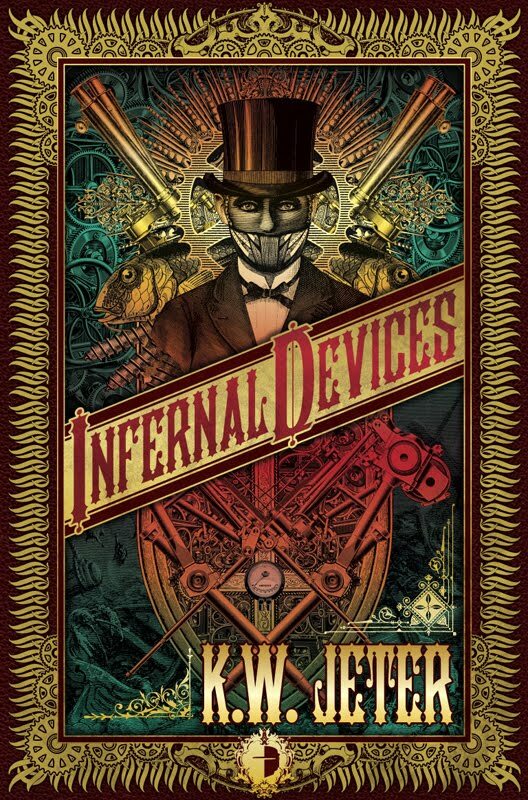 At the opening of Infernal Devices, he is visited by a man described as a ‘mysterious Brown Leather Man’. He brings with him a device which he claims was manufactured by Dower’s father. Whilst Dower has inherited his father’s business, he has certainly not inherited his skill with machinery. His inability to work with his father’s more complex pieces has reduced him to the servicing of the more basic pieces. Indeed, he recounts the tale of a local scandal at a local church where his poor workmanship went wrong. Accepting this commission from the Brown Leather Man leads Dower through a series of bewildering and life-threatening adventures. As well as being, at best, a journeyman watchmaker, Dower doesn’t seem to be a particularly imaginative or passionate man. As it transpires, this is integral to the plotting, his nature was by design. As a literary device, any confusion that Dower feels from the unfolding events are transmitted to the reader quite successfully. The visit from the Brown Leather Man is followed by a visit from Graeme Scape a man who makes his living touring the country with a musical automata. Though Dower is aware of much of his late father’s work, he is a little confused by Scape’s asking for a violin playing clockwork man. This piece is unknown to Dower and he and Creff (his manservant) mistake Scape and Miss Thane, his partner, for the henchmen of the Brown Leather Man. This will – as with many other seemingly minor and unconnected details – come to mean a little more as the novel progresses. Despite his somewhat stolid nature, these two visits have piqued Dower’s interested sufficiently that he wishes to investigate further. He freely admits that the initial agreement to attempt repair of Brown Leather Man’s device was probably foolhardy and based on an element of avarice on his part. The coin used by the Brown Leather Man to pay Dower turns out to be of an unusual design. It features a ‘St. Monkfish’. Not being a particularly observant man, Dower initially believes that St Monkfish is merely a saint outwith his ken. He sets about discovering a little more about the provenance of the coin in order to get to the bottom of the strangers visits. He is led to an unfamiliar borough of London, called Wetwick, populated by people who look and behave in an unusual manner. Though it does seem that Dower has acknowledged that these people are not perhaps the same as your usual Londoner (and that he may be on the trail of his St. Monkfish), I don’t get the feeling that he is particularly observant. The mystery of these piscine people is cleared up a little more when, later in the novel, he arrives in Dampford where the descendants of people who have been breeding with Selkies to produce these hybrid creatures. This provides a further kink in the story, as it turns out that these people supply the exotic ‘green girls’ beloved of the jaded upper classes who frequent London’s brothels. The novel from this point is, in truth, little more than an extended chase. It’s not particularly long and we are introduced at an almost whirlwind speed to a variety of scheming individuals and organisations, including remnants of the descendants of Cromwell’s puritan army, a man who wishes to destroy the world using a mechanical resonance machine (developed by Dower’s father) in order that he can signal to alien beings. This, and I imagine that it was possibly deliberate, reminded me of Nikola Tesla’s claim to have developed a machine which could cause earthquakes. We also discover the Brown Leather Man’s interest in all of this. Of course, we realise that Dower’s frequent brushes with death are unlikely to lead to his death, given that he is writing the novel as an account of his days running up and down the country. The breakneck pace of the novel does tend to mean that many of the characters aren’t particularly well-drawn and many of the ideas are thrown in and discarded with some haste. Indeed, some of the characters appear to have little motivation beyond who can make them the best offer. Dower himself is largely passive in all of this. Though he does take the time, initially, to investigate the odd events that start the story, he is basically incompetent and only doesn’t die several times over thanks to the intervention of other characters. In this, Jeter is largely successful. There is one element of the writing which did jar for me, however. Scape speaks in a manner not recognised by Dower, though the reader will realise that it is, in fact, 20th Century American slang. Though it did seem to be American slang as learned by somebody who was not of that time and place. This being a fiction, it’s not too difficult to guess possible reasons why this might be. Although I must confess that I wasn’t exactly right with my guess, he is not a time-traveller in the H.G. Wells sense, rather he was able to see the future using one of Dower’s father’s devices and it is from this that he learned the slang. I’m a little conflicted about this technique. It works in the context of the novel. His use of the American vernacular seems a little over the top and even stilted, which is believable for someone who knew it, but hadn’t lived it. Further, if a man such as Dower were presented with a man who spoke as Scape does, I think that it is fair to say that he would find his speech jarring. So from this point of view, Jeter’s writing his dialogue in this manner is valid. The problem for me as a reader was that it also had the effect of jumping me out of the flow of the narrative. As I say, however, this is an entirely personal reaction to the writing. There is a feeling with this kind of novel that it may just take on the trappings of Victorian literature, bung in some cool devices and right a rip-roaring adventure with little thought for the moral and political problems at the heart of Victorian society. Well, OK, that may just be me imposing my own interests on the fiction. As it happens this novel is a chase across the country occasioned by the discovery of a number of, well, infernal devices. However, I do tend to feel that (as one of the earlier writers in this mode) Jeter has given some consideration to this. On his journey, Dower meets with a Victorian society which styles itself the Ladies Union for the Suppression of Carnal Vice. It transpires that the head of this organisation is actual engaged in the trafficking and supply of fish/human hybrids from Dampford to her brothel which caters to the wealthy of Victorian London. This, I believe, points to the hypocrisy at the heart of the elite in Victorian Britain. I can’t quite decide how I feel about this novel. Jeter does quite successfully evoke the feel of the era. The story never stops moving and so it never felt like a chore to read. It does even avoid being entirely brass and clockwork machinery with little regard for the deeper problems in Victorian society than this. Further, the plot involving the Brown Leather Man could even be read in the context of environmentalism, his people suffering the consequences of destroying the environment for short-term gain with little thought for the consequences for wildlife or people. On the other hand, I didn’t feel that it hung around long enough for the proper exploration of any of the issues raised. I don’t regret reading it at all, and I certainly didn’t hate it. I just can’t say that I particularly loved it. There is much for people to enjoy and I wouldn’t discourage anyone from reading it, if you’re looking for a chase through Victorian Britain with mad scientists, puritans and fish-men, then I think that there is some enjoyment to be had here. This entry was posted in Review and tagged k.w. jeter, novel, sf. Bookmark the permalink.